Long time readers of my website know that the two bands I most regret not listening to in the 90's are Seaweed and Jawbox. I've gotten into both way after the fact and had to do some digging to get those records into my collection. Seaweed was tough, but I've been pretty lucky to have been presented with quite a few Jawbox reissues to make their quest a little easier. I was especially excited to see that Arctic Rodeo was involved in this 2xLP as they did such great work with their Burning Airlines reissues. 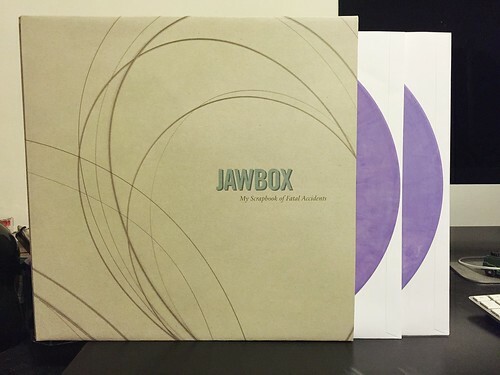 That high water mark for quality is still being met with this Jawbox reissue. The artwork is printed on thick, sturdy cardstock. There's not one, but two hefty booklets with pictures, discography information and what looks to be a list of every single show the band ever played. I'm pretty blown away by everything before even listening to it. Musically, it just annoys me that I wasn't able to appreciate this band when they were around. The way they are able to craft serious, powerful songs, but still cram in deceptively catchy hooks and melodies is something that so few bands are able to do. This album compiles a slew of 7" and compilation tracks, a Peel session and a few live nuggets. It's a pretty essential add on to the other Jawbox full lengths. At an hour and twenty minutes, it is a bit long to get through in one sitting. I've always thought forty-five minutes was a pretty ideal album length, though I certainly understand the desire to present as complete a package as possible and wouldn't dream of cutting anything from this set. You'll just need to block off a bit more time to listen to it.